Forklift operators appreciate the utility of the Plastic Pallet Bumper and, once applied do not want to work without one. The more time operators spend on lifts and off the floor, the faster and safer product handling occurs. Fewer interruptions also reduces overall stress and enhances operator focus and awareness while on the forklift. We realize pallets and equipment are assets that require significant resources. Companies utilizing Plastic Pallet Bumpers on their forklifts protect these assets by extending the usable life of their pallets and dock equipment. Less time and money wasted due to lost sales, product returns, rework and disposal. Fewer back charges and fines from receivers due to broken pallets and damaged product. Faster loading and unloading because less time wasted handling damaged product. Increased productivity due to fewer delays for drivers en route. Higher on-time service ratios and increased customer satisfaction. Decreased wear on forklifts and dock equipment from pallet debris on dock and trailer floor. Reduced pallet debris prevents instability from sudden shifts in load center while handling. Less time off forklift to clean-up pallet debris and handle damaged product. 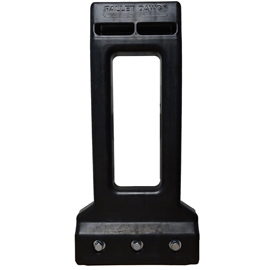 “Our customers have eliminated their product and pallet damage by installing the Plastic Pallet Bumper. They work fantasticlly”.